If you suffer from that morning stiffness in your lower back or pain in your knees and hips it’s probably the way your sleeping. The Sleep Knee Spacer Cushion supports your spine in the natural position allowing tense muscles to relax so that you get a restful nights sleep and wakeup fully energized. The contoured thigh supports fit around your knees holding the pillow in position. Front and rear bumpers prevent you from rolling onto your stomach (an unnatural position that causes spinal stress and back pain). Relief of: morning back, hip and knee stiffness; Sciatic leg pain; Restless sleep. 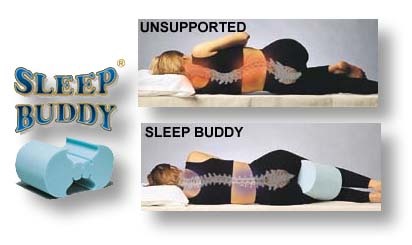 Sleep Buddy Knee Spacer Cushions are made of polyurethane foam and includes a polycotton pillow protector.